After a month of intensive training, 4 new Business Development Services (BDS) advisors have travelled to Central Tanzania (Singidi and Kondoa) to assist two SMEs. These SMEs have plans to enhance their business and are seeking finance from the SME Impact Fund to realize their ambitions. The BDS advisors assist them with their management accounts and preparation of business plan, including financial projections. The new BDS advisors were selected after attending an assessment day, designed by the Match Maker Associates team. It turned out to be a gruelling day for most candidates and only a few made it to the next stage: the training. The first two weeks of the training focused on a wide range of business advisory skills and the trainees were fortunate to be trained by a very experienced International Labour Organisation (ILO) trainer. Hereafter, a financial analyst expert from The Netherlands took over and he exposed the new BDS advisors to the financial analyses model he developed together with MMA over the last years. 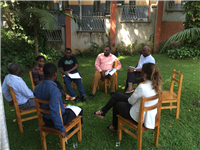 By undertaking various real life case studies, the trainees started to master the model. The last and fourth week of the training covered a wide range of interesting tools, such as value chain development, value proposition canvas, business plan template, advisory services frameworks, et cetera. After completion of this intense and elaborate training, the new BDS advisors were feeling ready for their challenging task of supporting SMEs to become ‘investment ready’. The ILO trainer accepted the job of coordinator and coach for the next six months and his role is to ensure that the new BDS advisors are providing value-adding services to the SMEs. Obviously, the whole MMA team will support him and backstop his team in the field. The stakes are high this year; 30 SMEs will be supported with their management accounts, of which 24 SMEs will qualify for business planning, including investment proposal support. Not all may make it for SIF finance, but the expectation is that at least 18 SMEs will become SIF clients before the end of 2015. Without the great financial support of Cordaid and the Africa Guarantee Fund (AGF), this project would not be possible. BDS is a very time consuming and costly process and even though the SMEs contribute to the costs, external funding is a necessity to make it affordable and accessible for SMEs. The funding is initially for a year but MMA has the expectation that based on the results of this (pilot) year, more and long term support can be mobilised. The mid-term evaluation by Cordaid in the middle of the year will hopefully be an important input in achieving continuation and sustainability of the these critical BDS services. Together we make entrepreneurial dreams come true!